Silicon Valley stalwart HP, a company with deep roots in the Mac community, has arrived at Macworld | iWorld bearing printer goodies in the form of several new color LaserJets for small offices, home offices, and mid-sized businesses. The company is showing one single-function and two multifunction models on the show floor. The four-color multifunction (MFP) models showcase a new 3.5-inch touch screen display, with intuitive, visual navigational controls. The touch screen is large, responsive, and much easier to operate than the navigation in previous models. "The design has been streamlined so that these new printers are very easy to operate," said Sherri Harper, HP's LaserJet marketing expert. What's more, these printers are all about mobility and printing on the go." The HP LaserJet Pro 400 color M451 is a single-function model designed for businesses that want to create professional-looking color documents, such as marketing materials. It prints up to 21 pages per minute in either black or color, at 600 dpi. The printer comes in three models. Automatic duplexing is available only on the M451dn (duplex/network) and M451dw (duplex/wireless) models. Built-in wireless is available only on the M451nw (network/wireless) and M451dw (duplex/wireless) models. The M451nw is $449; the M451dn is $499; and the M451dw is $549. The company is also showing the multifunction LaserJet Pro 300 color M375, for $599, and the LaserJet Pro 400 color M475, which comes in duplex/network and duplex/wireless models for $699 and $749 respectively. These models print, scan, copy, and fax. The M375 prints 19 pages per minute in black and color. It can scan at 1200 dpi in monochrome and 600 dpi in color, directly to a USB, email, or networked folder. It can also produce up to 99 copies at 300 dpi. The MFP M475 is similar to the MFP 375, but faster—it prints up to 21 pages per minute in black or color. It also includes standard duplexing. All the new printers are Web-connected and support Apple's AirPrint, HP ePrint, and HP Wireless Direct. Thus, they allow users to print anywhere and from any Apple mobile device. All allow Web-based administrative management via the company's Web Jetadmin software. 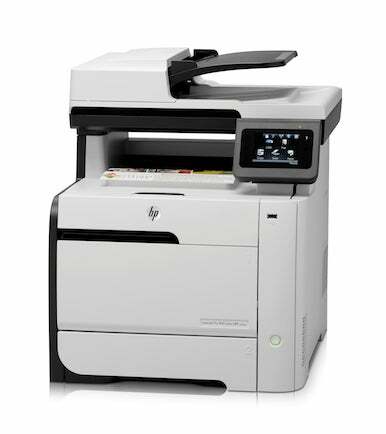 The HP LaserJet Pro 300 and 400 MFP series also includes support for HP business apps, which allow users to access and print Web content directly using the touch screen display. On display at the show, the printers should be available by February 1.